ALL our kids are bottle-raised, disbudded and incredibly friendly. Payment before kid leaves the property, please. If not already registered; ALL NAMES CAN BE CHANGED on the registration application. Kids will be healthy when you come and get them. All testing results are available for you to see. 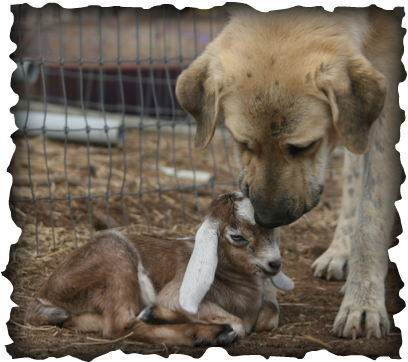 The kids are guaranteed to be G6S normal, and all adult goats on the property have been tested free of CAE and CL. We do not guarantee their health after they leave the premises. We feed the kids goat milk. We recommend your feeding goat milk. If you cannot find a safe supply of milk, talk to us. We may be able to help. We were on DHIR testing in 2012 and 2013. Results for our does are on the ADGA web site, under pedigree search. Links are on each does' page. Our goats' LA scores are on their individual pages, as recant as 2017! Maleficent is a clever, sweet goat. She is dry, but both of her littermate sisters freshened well the past year. She is the sort of goat we would usually sell for far more than we are currently asking, but this is because Maleficent doesn't like being touched. While she is a friendly animal, and is happy to follow anyone around the yard and nibble at things, she has no interest in being pet or handled. Sulu has served us as a buck for multiple years now, however because of the small size of our herd and our hope to prevent inbreeding, Sulu would be best serving another herd. He is a sweet tempered boy and is always easy to handle, even when in rut. We have been pleased with his kids and we are very sad to see him go, however as pretty a buck as he is, he should be used. Theta came out pretty, when born he was not reserved, but was too pretty of a boy to wether. While he is too related to my does to be able to serve my herd well, I have yet to regret not wethering him. GREAT BREEDING: These goat lines come from established breeders who have been working to create goats who both exhibit show and milk properties. Some goats achieve this better than others, but they are all established bloodlines. CAE/CL Free - Tested annually at least. VERIFIED DATA: Many of our adults are linear-appraised by one of ADGA's four certified Linear Appraisers (see our website for scores), and our does have been and will again be on official DHIA owner/inspector milk-production testing; you can see their current results on the ADGA site if click on their registration link on our website and click on 'USDA data'. RAISED WELL: Our young goats are raised on good goat's milk, so lots of calcium gets incorporated into their bone. They are bottle raised, are super-friendly and will be disbudded and tattooed, so that they will be legal to show in ADGA shows. The goats are incredibly people oriented and are used to being extensively handled because we play with them LOTS. (RELATIVELY) low price for the quality of these goats: Search other places and compare! 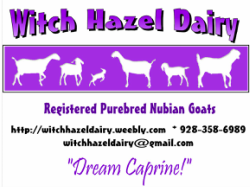 Get your Witch Hazel goats now. ALSO, you can go reserve your next-year's kids, now on our Breeding page!